We are getting more clients who wear LST kimonos for their wedding. A bride and groom together visit our salon, or a bride by herself comes to have a look of our kimonos. Recently, we had a visit of mother and daughter who looked for the bride’s costume. The mother seemed to have a different taste about the design and gave the advice to her daughter. “I think this design is similar to the one you wore at the “coming to the age” ceremony. “You choose whatever you like.” she said. 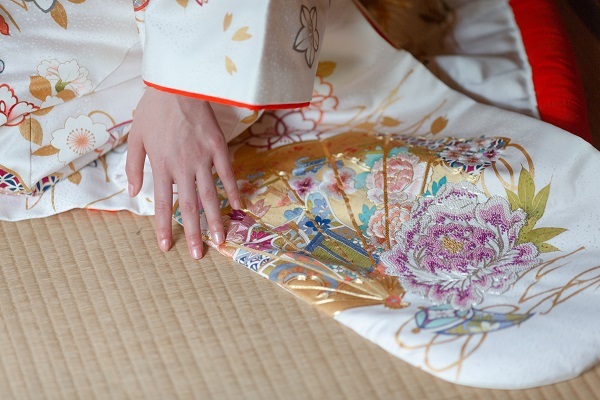 It was a delightful moment when both agreed and selected one kimono they liked. The mother looked so happy when she took pictures of her daughter trying the kimono. We could see how much she cared and loved her daughter. I imagined that someday this moment would become one of their nostalgic memories. The wedding ceremony is the event which the couple’s family, relatives and friends and others are wishing the couples happiness. They need to prepare so many things before the wedding ceremony. Our job is to help the couples to prepare their marriage. I strongly hope that they can enjoy and have a good time even during the preparation. This feeling became much stronger when we started helping them to choose the costume.